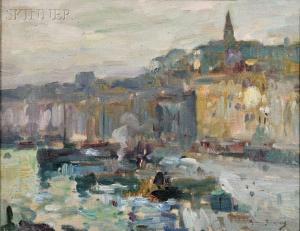 Find artworks, auction results, sale prices and pictures of Maurice Bompard at auctions worldwide. 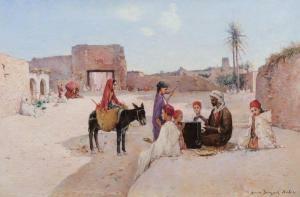 70 - MAURICE BOMPARD (1857-1936) Déjeuner dans le Fondouk, Biskra signé et situé \‘Maurice Bompard, Biskra\’ (en bas à droite) huile sur toile 54,5 x 82 Signed and located \‘Maurice Bompard, Biskra\’ lower right; oil on canvas; 21.7/16 x 32.2/4 in. PROVENANCE Collection privée, Marseille. 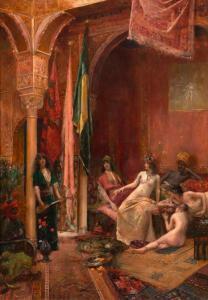 Description: BOMPARD, MAURICE (Rodez 1857 - 1936 Paris) Dancers in an oriental interior. Oil on canvas. Signed lower left: Mau. Bompart. 120.7 x 91.4 cm. Provenance: Swiss private collection. 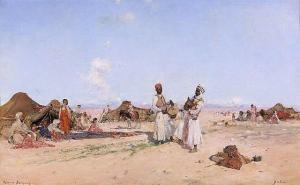 --------------- BOMPARD, MAURICE (Rodez 1857 - 1936 Paris) Tänzerinnen in einem orientalischen Interieur. Öl auf Leinwand. Unten links signiert: Mau. Bompart. 120,7 x 91,4 cm. Provenienz: Schweizer Privatsammlung. Oil on canvas, 10 3/4 x 14 in. 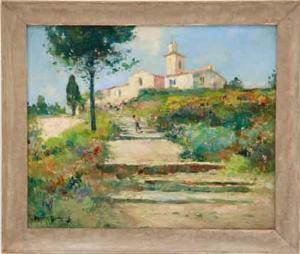 (27.5 x 35.5 cm), framed. Provenance: By descent within the family of the artist, from the collection of the late Henry C. Veit, grandson of the artist. Provenance: Estate of Augusta Mowinckel "Momse" Hyde, Rutherfordton, North Carolina. *** Notice to bidders: The absence of a condition report does not imply that an object is free of defects or restoration. All lots are sold 'As Is' and in accordance with the Conditions of Sale. Condition reports and additional photographs are provided by request as a courtesy to our clients. Condition reports are not to be considered substitutes for physical examination by you and/or your advisors. Charlton Hall's specialists are not trained professional conservators or restorers; we urge you to inspect each lot yourself or have your agent do so on your behalf. Prospective buyers should satisfy themselves as to condition and must understand that any statement made by Charlton Hall Galleries, Inc., or its specialists is merely a subjective opinion, notwithstanding written reports or any discussion concerning condition in this catalogue. Prospective buyers should bear in mind that these reports will not disclose any imperfections which may only be revealed during the course of subsequent restoration and/or repair. Buyers are reminded that Charlton Hall Galleries' warranties with respect to property are limited as set forth in our Conditions of Sale and do not extend to condition. Condition reports are provided by request on a "first come, first served" basis. Requests submitted close to or during the auction may not be completed.